Successfully Added ECT Fog Mini Rebuildable Tank Atomizer - Wax Atomizer, 0.1 Ohm Resistance, 50 Watt, 510 Thread, 1.6ML Capacity to your Shopping Cart. Say hello to the ECT Fog Mini, a high-end 50W atomizer that features a durable and rebuildable design. Crafted out of stylish chrome plated brass, this beautiful atomizer does not only feature a design that is appealing to the eye but also is extremely durable. Along with its brass body comes a beautiful high borosilicate glass tank that is highly resistant against heat and that allows you to see your current oil wax level at any time. 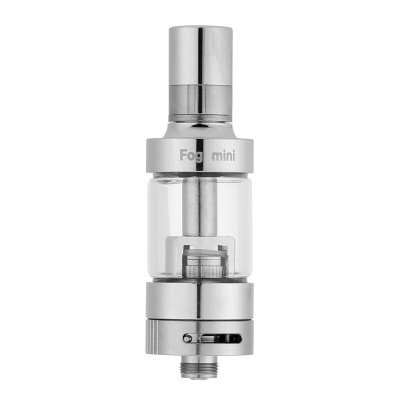 Its rebuildable design makes the ECT Fog Mini easy to clean and additionally allows you to replace individual pieces in case necessary. Along with its 510 thread, this powerful 50 Watt atomizer can be used with the majority of vapers out there – allowing you to upgrade your current vaper and to truly enhance your vaping experience. Thanks to its adjustable airflow design, the ECT Fog Mini lets you manually adjust your air input – allowing you to customize the taste and amount of vapor created. From now on you’ll be able to take the most out of your upcoming vaping sessions and enjoy them to their absolute most as this powerful atomizer allows you to adjust your vaping experience to your own, personal, liking. Additionally, the ECT Fog Mini atomizer also features a heat emission hole on its vapor tip that takes away the annoying burned throat feeling experienced when using lower quality atomizers – ensuring that with this powerful vaper atomizer you’ll truly enjoy a top-end vaping experience at any time. Not only does the ECT Fog Mini 50 Watt atomizer produce great taste, it also allows you produce stunningly large vapor clouds thanks to its low 0.1 Ohm resistance. Simply fill up your atomizer tank with 1.6ML of your favorite taste of wax, and you’ll be able to relax and vape away the day while enjoying the delicious taste created by this atomizer while, simultaneously, amazing all your friends and people standing by with massive vapor clouds. Featuring a traditional top filling design, this 50W atomizer can be efficiently refilled at any time. Thanks to its low Ohm resistance, powerful 50W design, 510 thread, and adjustable air flow settings – the ECT Fog Mini is a beautiful and high-end vaper atomizer that brings along tons of possibilities for all beginning and advanced vapers alike. No matter your vaping style, this beautiful 50 Watt vape atomizer is guaranteed to deliver you with an extraordinary and powerful vaping experience that comes along with great taste and huge vapor clouds. Suitable for all vapers out there, this ECT tank atomizer is the perfect vaping accessory that helps you upgrade your current vaper and allows you to take your vaping experiences to the next level. The ECT Fog Mini rebuildable tank atomizer comes with a 12 months warranty, brought to you by the leader in electronic devices as well as wholesale electronic gadgets..
Applicable Prodcuts: Shredded Tobacco, Powder, Tobacco Wax etc. Arabic: - رذاذ خزان صماماته - Chinese Simplified: - Rebuildable 坦克雾化器 - Czech: - Opravitelný Tank Atomizer - Dutch: - Rebuildable Tank verstuiver - French: - Atomiseur Tank reconstructible - German: - Reparierten Tank Atomizer - Hebrew: - טנק rebuildable atomizer - Hindi: - Rebuildable टैंक कणित्र - Hungarian: - Rebuildable Tank porlasztó - Italian: - Atomizzatore del carro armato rebuildable - Japanese: - Rebuildable タンクアトマイザー - Korean: - 넣어서 탱크 분무기 - Malay: - Kereta kebal rebuildable pengabut - Norwegian Bokmål: - Rebuildable Tank Atomizer - Romanian: - Atomizor Rebuildable Tank - Russian: - Тайтла танк атомайзеры - Spanish: - Atomizador del tanque autos - Thai: - Rebuildable ถังฉีดน้ำ - Turkish: - Rebuildable Tank Atomizer - Vietnamese: - Rebuildable xe tăng phun.